Find your inner Zen with the Chi. 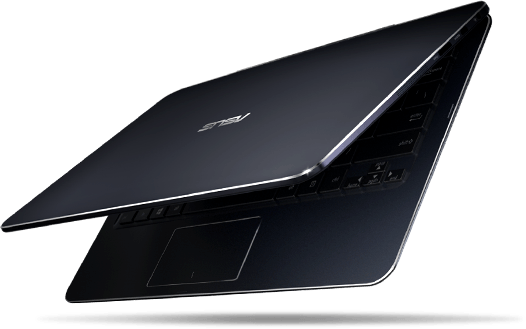 The runaway success of the lauded Zenbook Ultrabooks and Transformer tablets have prompted Asus to create a whole new family of convertibles under the Transformer Book series known as the Chi. 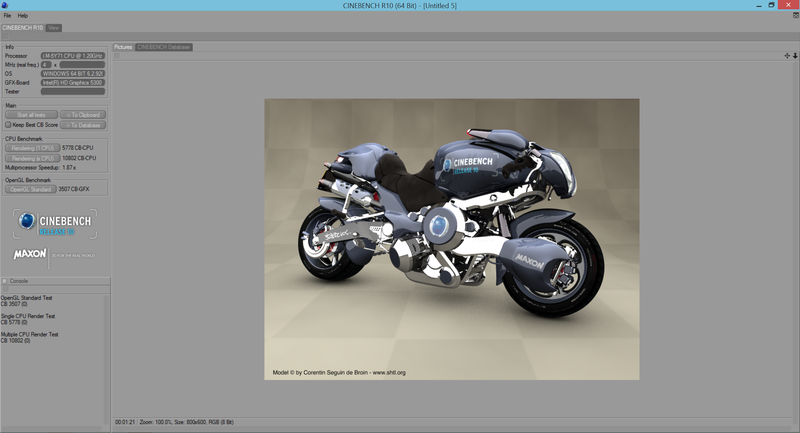 The T300 Chi is the most powerful of the bunch and its 2560 x 1440 display has us impressed. 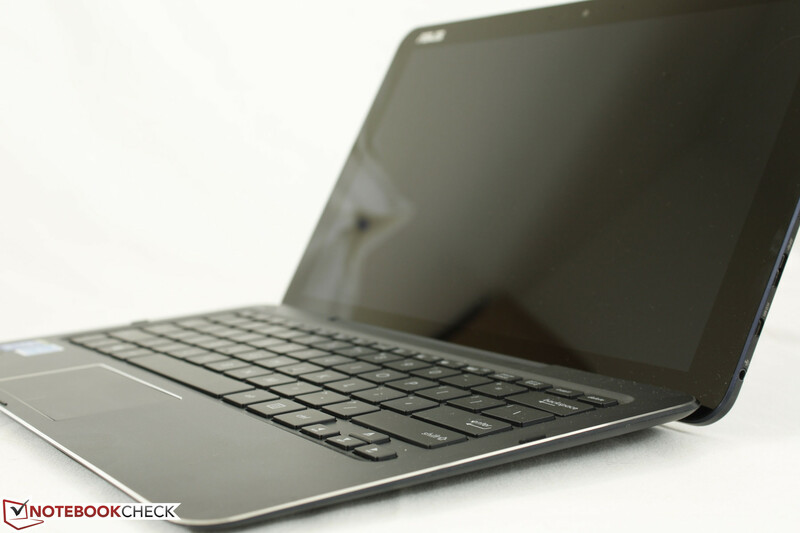 Asus unveiled the 12.5-inch Transformer Book T300 Chi late last year at Taipei and more recently revealed its smaller siblings the 10.1-inch T100 Chi and 8.9-inch T90 Chi at CES 2015. The new family sports Bay Trail and Broadwell options from an Intel Z3775 to the Core M-5Y71 and are boasted as being thinner and lighter than a MacBook Air. Our review model today is the higher-end configuration for the T300 Chi and houses a WQHD (2560 x 1440) IPS display, a 1.2 GHz Core M-5Y71, 8 GB LPDDR3 RAM, and a 128 GB internal SSD for the retail price of $899. A lower-end model with a FHD (1920 x 1080) IPS display, an 800 MHz M-5Y10 SoC, 4 GB LPDDR3 RAM, and a 64 GB SSD is also available for at least $100 less. 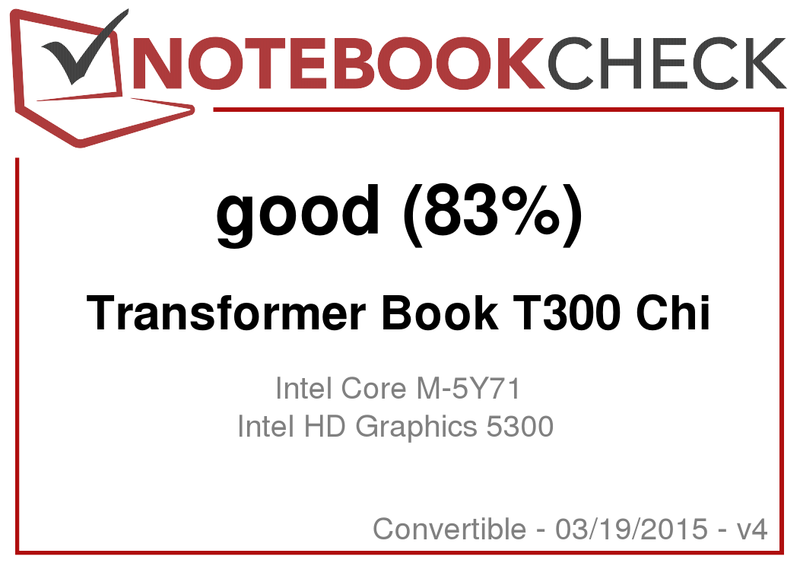 From the get-go, this is certainly the most attractive Transformer Book yet, but how does it handle with Intel's latest mobile Broadwell processor? 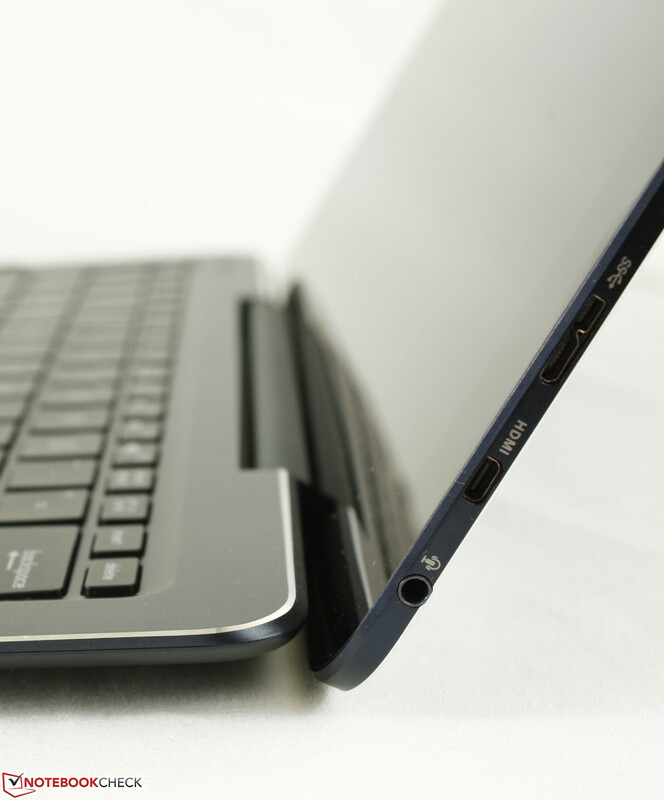 We'll find out here in our full rundown of both the T300 Chi and its included keyboard dock. 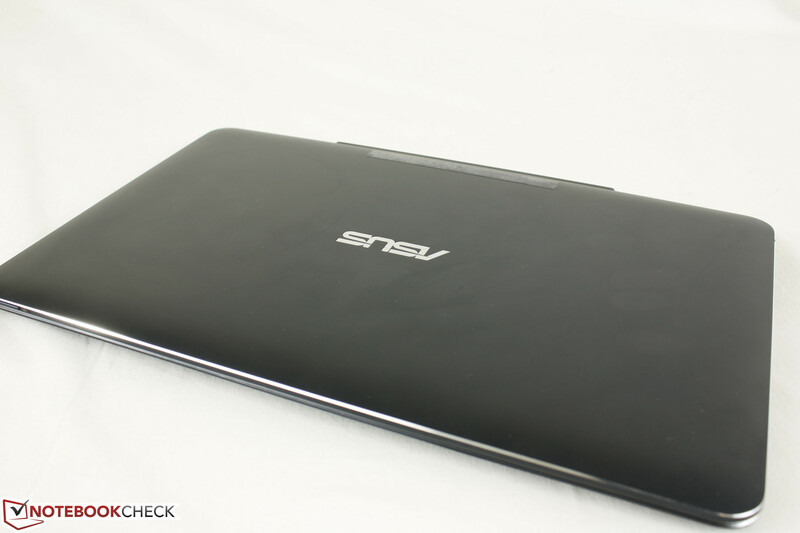 At first glance, the new T300 Chi can be easily mistaken as an ATIV Book 9 series from a distance. Its got the same dark blue color scheme, smooth matte aluminum body surfaces, chrome-cut edges and corners, and a flat ultra-thin profile from all angles. Slap a Samsung logo and Asus would have had everyone fooled. 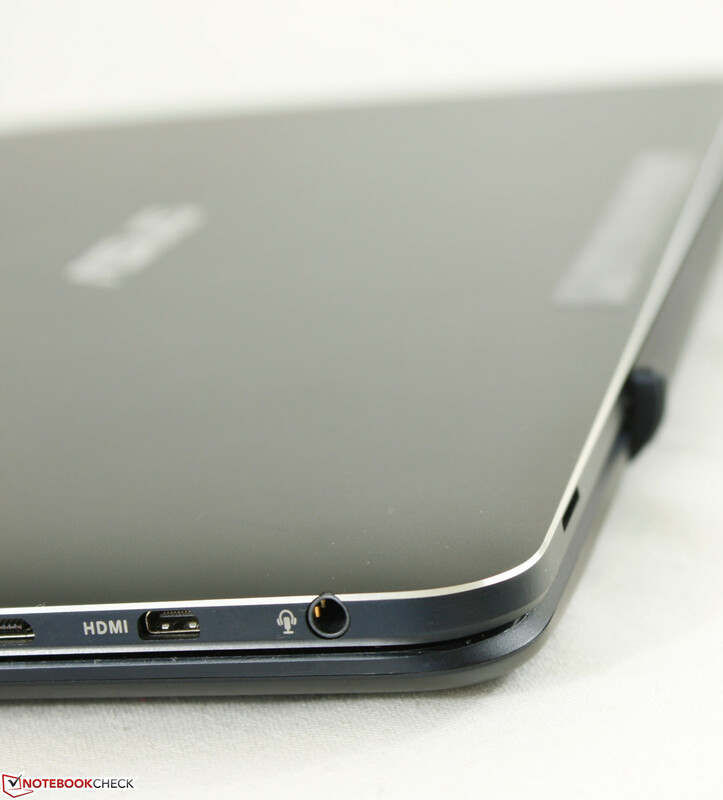 It's certainly a classier and less flashy aesthetic compared to Transformer Books of yore where the concentrically brushed aluminum lids made the models stand out a bit more from the crowd. The older TX300, for example, has a brighter and less subdued look. 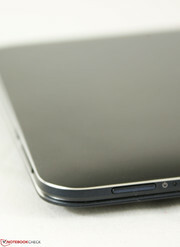 Construction quality is very good, especially for a thin 12.5-inch tablet. Twisting side-to-side produces no creaking or significant bending and applying pressure on the back or front results in no depressions. 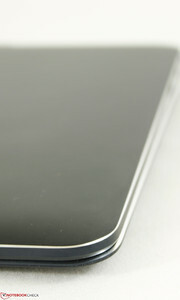 The device itself feels dense yet lightweight and its wide length makes it easier to hold in the landscape orientation. The keyboard dock is less impressive as it feels hollow with plastic keys. 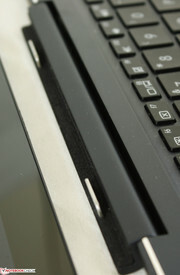 Applying pressure on the center of the keyboard will show some slight warping. Note that the keyboard attachment connects to the tablet with magnets and operates via Bluetooth; There are no switch releases or proprietary connections here as commonly found on most other detachables. This allows the user to more easily attach or separate the two pieces without much fumbling. The magnets here are powerful enough to hold the two parts together without fear of any accidents. 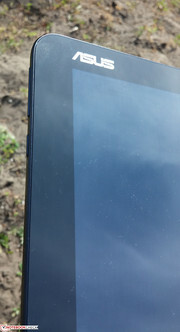 Unfortunately, the connection is not perfect as the tablet portion can still wobble like a regular display would on cheap hinges. 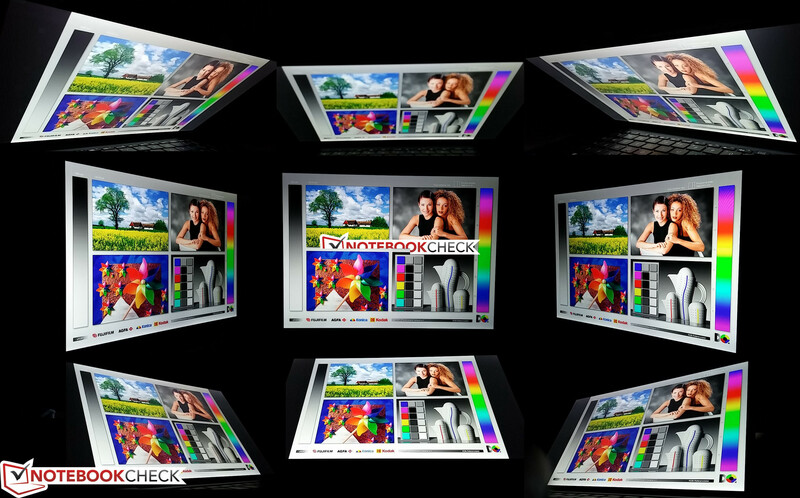 The maximum angle is also a bit low at about 130 degrees, but we imagine that this limitation is intentional to avoid the convertible from tipping over due to the heavier display. 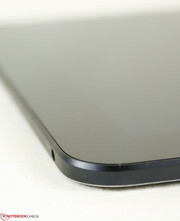 The size and weight of the tablet are attractive selling points at just 7.6 mm thick and 720 grams. 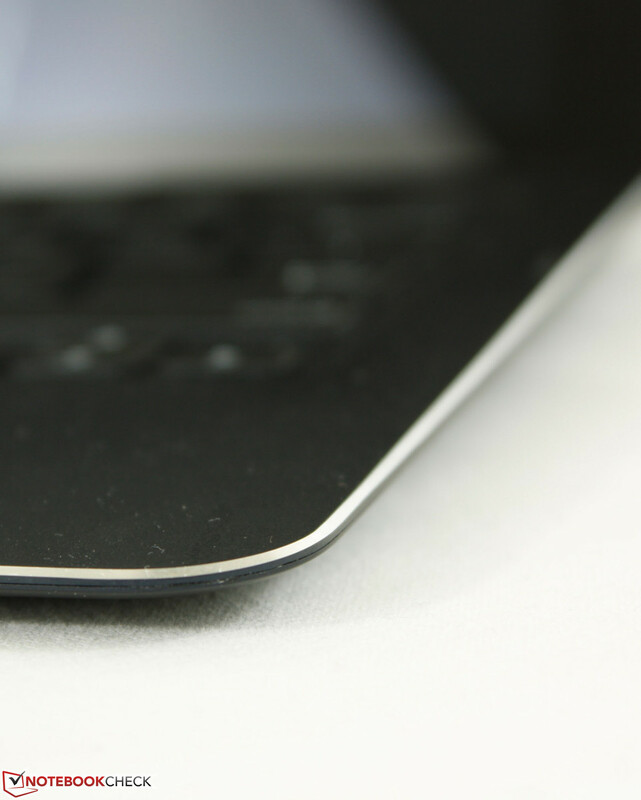 Meanwhile, the keyboard dock comes in slightly thicker and heavier at 8.9 mm and 725 grams. 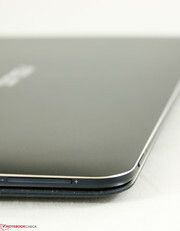 Even with the combined thickness of 16.5 mm, the T300 Chi is still a very thin 12.5-inch notebook. 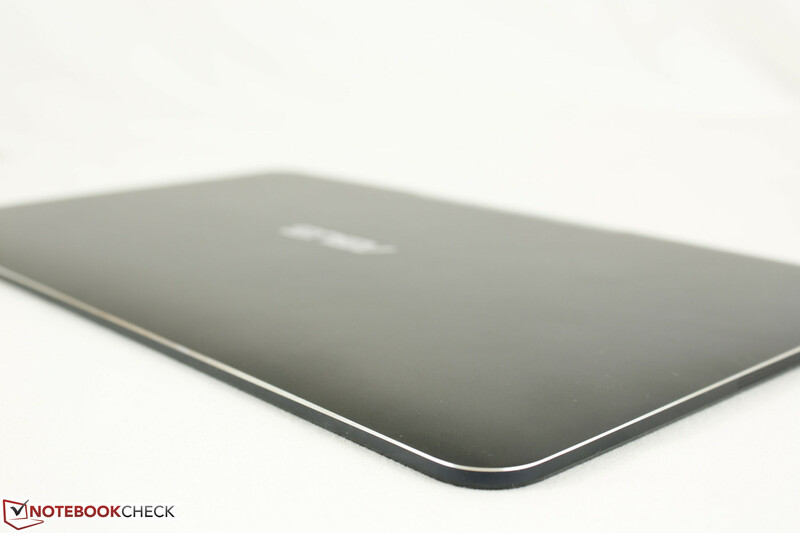 It's relatively lightweight, but Asus' own 13.3-inch Zenbook UX305 is about 200 grams lighter. The tablet itself lies between the Surface Pro 3 (9 mm) and iPad Air 2 (6.1 mm) and is also noticeably longer in length compared to other 12.5-inch devices, which means a larger bezel to hold onto. 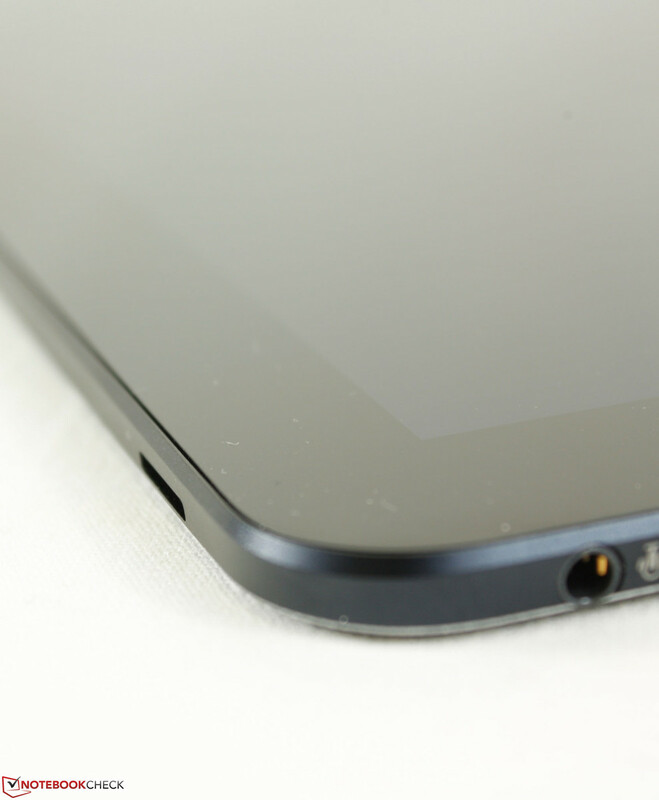 Outside of the expected 3.5 mm audio jack, the tablet includes a MicroSD slot with both microUSB 3.0 and micro-HDMI output. The keyboard attachment provides no additional ports unlike on many other convertibles or detachables. It does, however, have a single microUSB 2.0 port for charging the same way you would charge a smartphone. 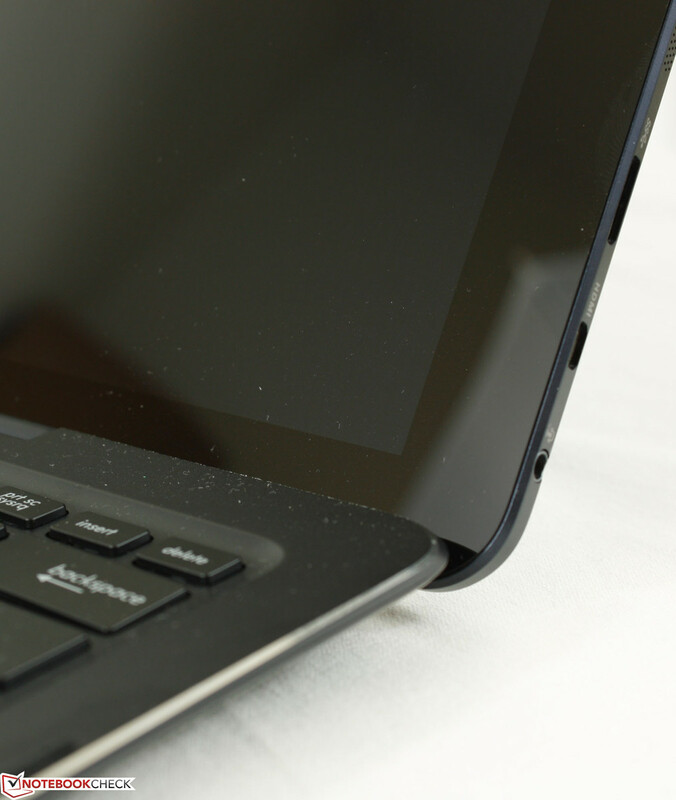 The tablet can also be used to charge the dock with a microUSB-to-microUSB 2.0 cable. 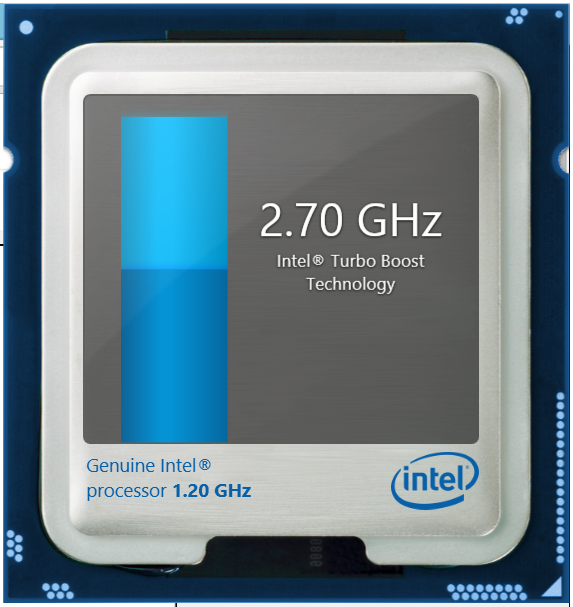 The integrated Dual-Band (2x2) Intel 7265 delivers a theoretical bandwidth of up to 867 Mbps on an 802.11ac network and integrates Bluetooth 4.0 with WiDi support. 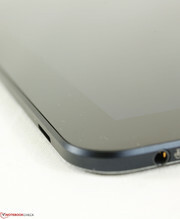 The addition of ac compatibiliy may have been a late decision as the tablet was originally announced with 802.11n only. We experienced no connectivity issues or random dropouts when connected to a standard home network. Unfortunately, WLAN is about all the tablet is capable of in terms of wireless communication. The T300 Chi has no built-in WWAN or GPS radios, which limits its usefulness outdoors. Asus throws in a very handy microUSB to USB 2.0 adapter with the T300 Chi that is oddly left out of every purchase of the smaller T100 Chi. Beyond that, there is also a microUSB-to-microUSB 2.0 cable, a small power adapter pouch, and Velcro cable tie. 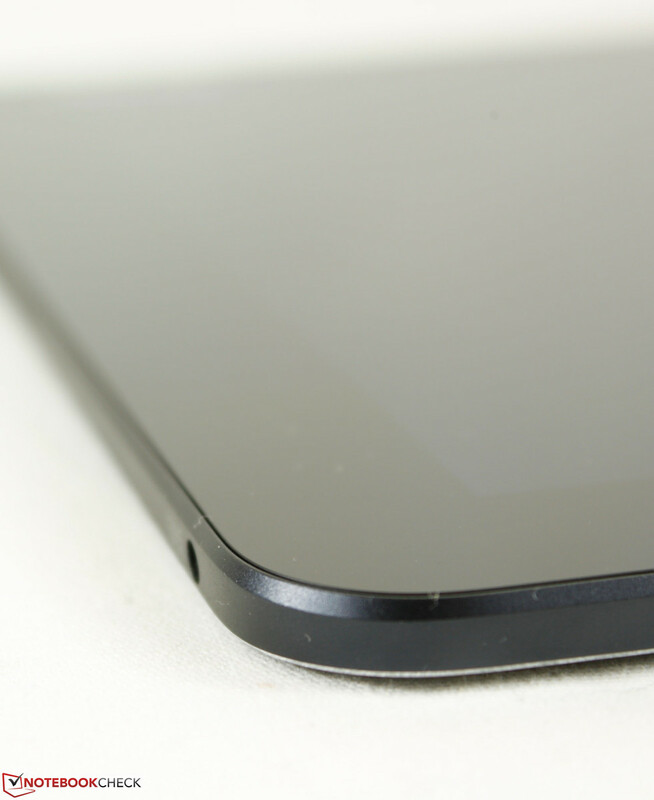 However, we would have also appreciated a velvet screen wipe for the super-glossy tablet or even a free stylus. An optional Wacom stylus is available for another $39. There are no other dedicated accessories for the tablet beyond the keyboard base itself as the unit lacks a proprietary docking connector. The warranty period is the standard 12 months from date of purchase and covers defects in workmanship and materials, including 3 or more dead pixels. Retailers who carry the T300 Chi are also likely to provide additional warranty options. 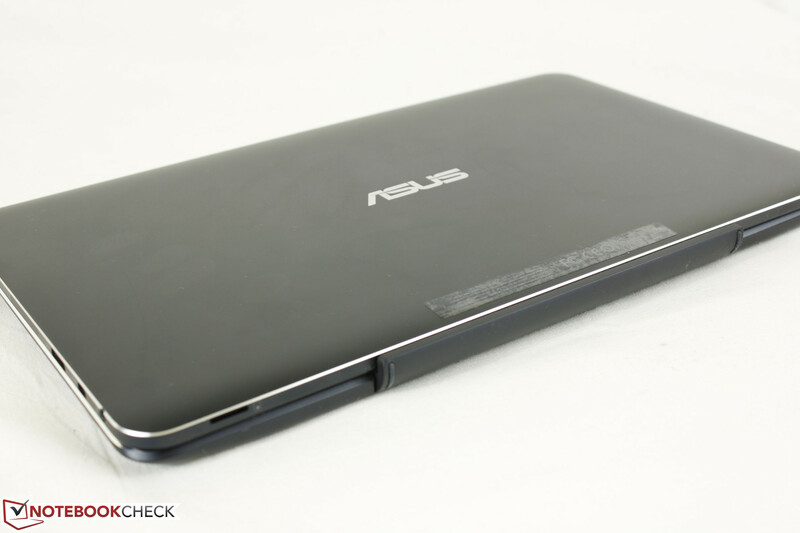 Asus throws in Accidental Protection coverage should the buyer purchase from select retailers and registers. The keyboard base attachment is Bluetooth-activated and will attempt to connect to the tablet whenever a key or button is pressed. 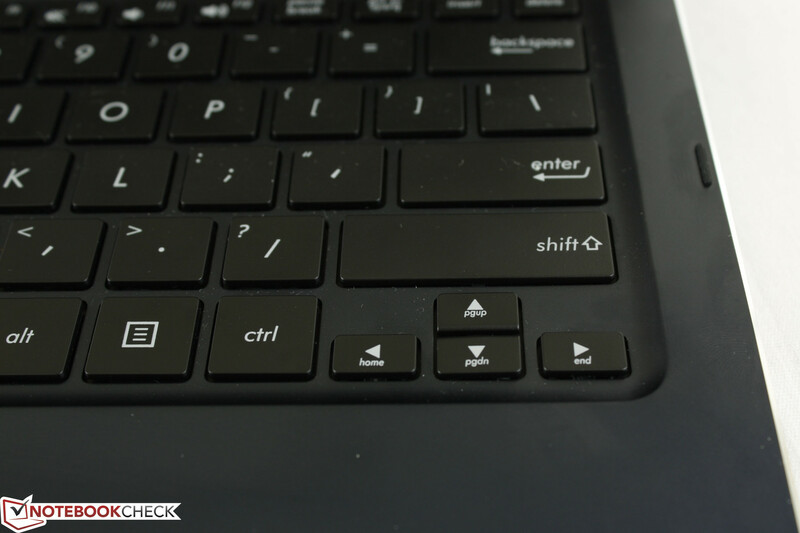 It offers no additional features outside of the standard QWERTY keys and touchpad. We were able to go for almost a full week of daily use without charging the base and the handy power management tool on the tablet will tell you the battery percentage remaining. With such a long battery life, it would have been nice to have included backlit keys as an option such as on the Envy x2. The keys themselves provide satisfactory feedback with a firm auditory response when pressed. 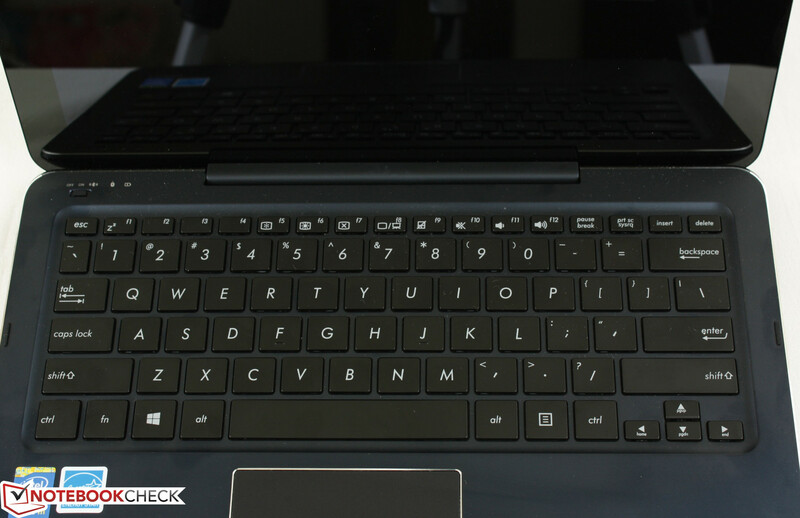 This avoids the feeling of spongy keys when typing, but travel is still quite shallow even for a notebook. The small Arrow keys are a bit worse as they feel rather squishy in comparison, which is typical on notebooks in this size category. Nonetheless, the main keys feel comfortable and responsive for regular use. The touchpad works as intended with no glitches or jumping cursors, but its diminutive size (9 x 4.5 cm) limits its usability. Ergonomically, it is difficult to accurately point, click, or highlight the necessary texts or icons and we find it easier to simply use the touchscreen for the more mundane inputs. Otherwise, the integrated mouse keys are good with a soft but satisfactory click. 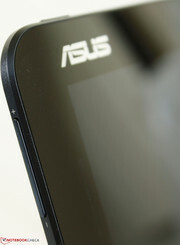 Asus Smart Gesture supports multi-touch inputs up to three fingers and other customizations including edge gestures and mobile control with a smartphone or tablet. Simpler inputs like scrolling and zooming work quite well to our surprise, but anything more complicated will be at the mercy of the limited surface area. A bright and beautiful 2560x1440 WQHD screen graces the T300 Chi with very crisp colors and texts, especially on a small 12.5-inch form factor. It's not quite 4K resolution, but the 235 PPI density should be more than satisfactory. The underlying Sharp LQ125T1JX03 panel is currently not found on any other model in our database, so this is a unique panel in the tablet space. Average brightness is just shy of the 400 cd/m2 mark and is comparable to 12.5-inch notebooks like the ThinkPad X250 and Dell E7250. 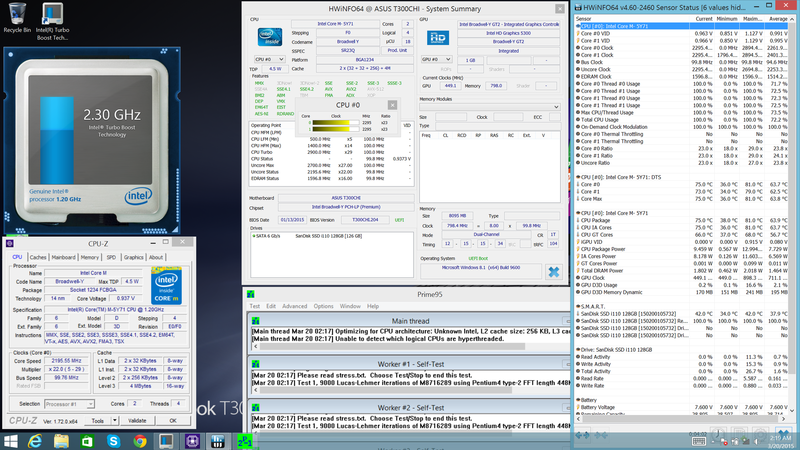 Contrast is very good at roughly 800:1, which is in line with Asus' high-end Zenbook UX models. Asus promises a 72 percent coverage of the NTSC spectrum. Our own measurement reveals coverages of 87.9 percent and 66.9 percent of the sRGB and AdobeRGB standards, respectively, which are indeed quite high for a tablet and is comparable to a ThinkPad T450s. Most budget and mainstream displays often only cover 60 percent of sRGB and 40 percent of AdobeRGB, so the T300 Chi is capable of providing deeper and more accurate colors. 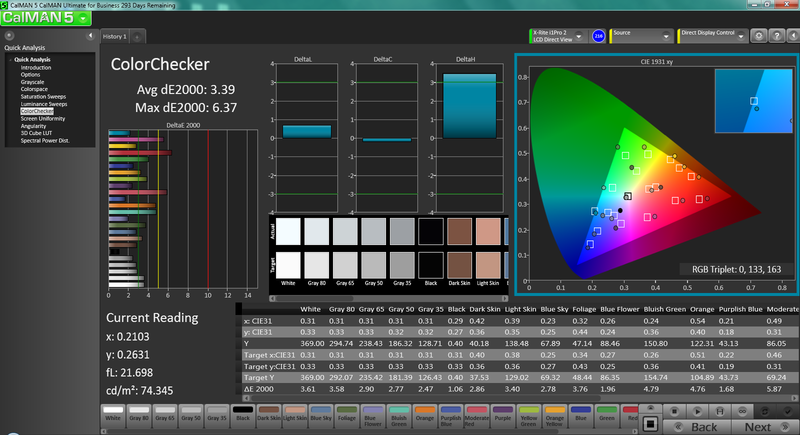 Further display analyses with an X-Rite spectrophotometer reveal a very good grayscale, but color saturation to be way off. 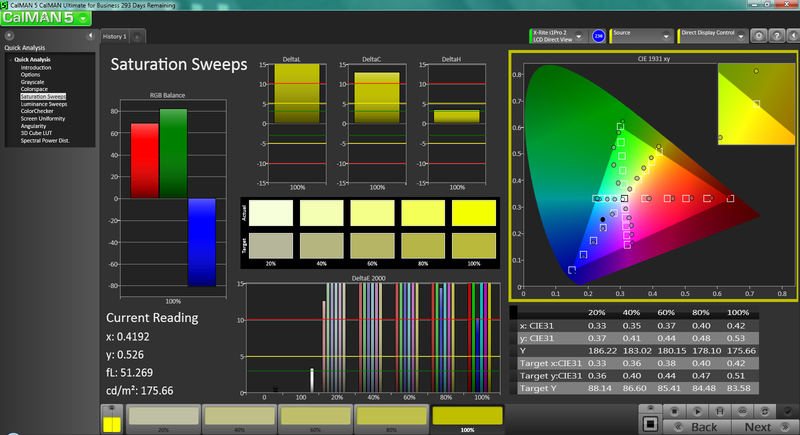 Indeed, colors appear to be brighter and lighter than they should be at the tested saturation levels. 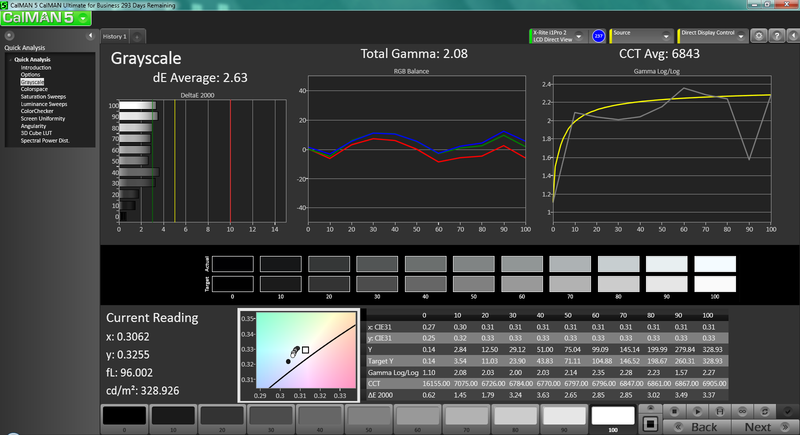 A quick calibration effort largely fixes the issue with most colors falling below 5 units of the DeltaE 2000 scale. Red and Magenta are represented a bit less accurately than the other primary and secondary colors. 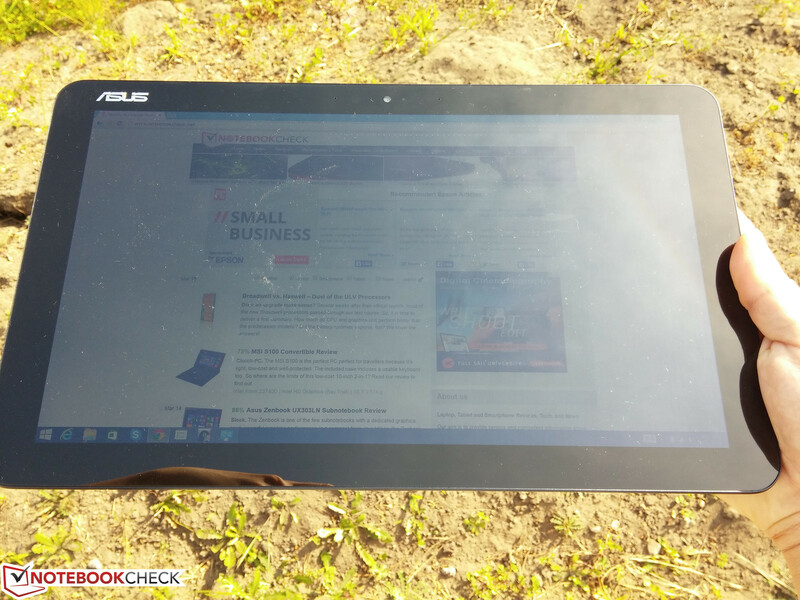 Though a lightweight tablet, outdoor usability is difficult due to the glossy display. 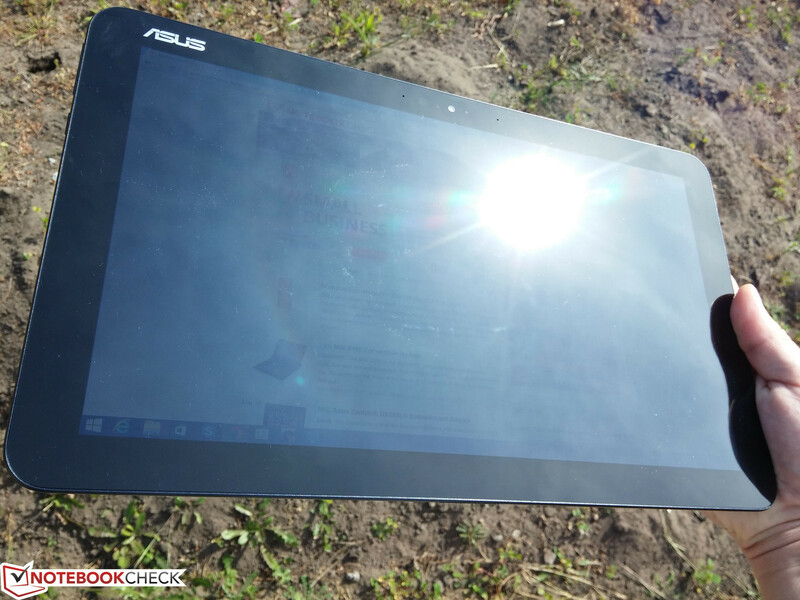 Furthermore, maximum display brightness will drop to about 300 nits if not connected to its AC adapter, which is not nearly bright enough for comfortable outdoor use under direct sunlight. Anything brighter than a cloudy or overcast day will wash out the display of the T300 Chi. 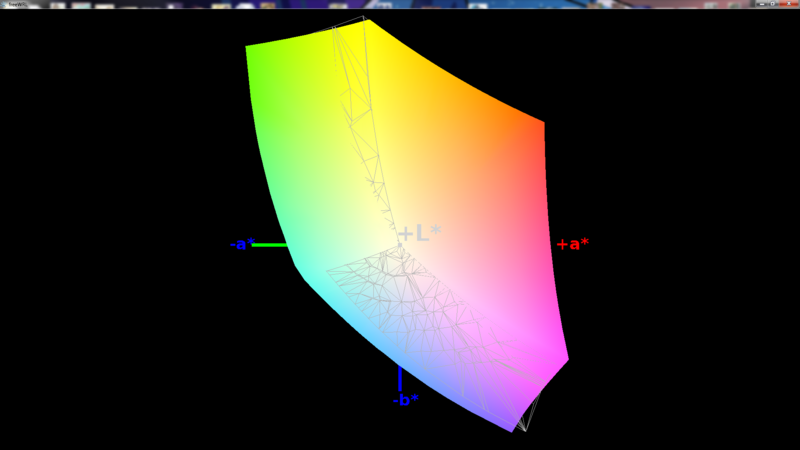 Viewing angles are excellent due to the underlying IPS panel. 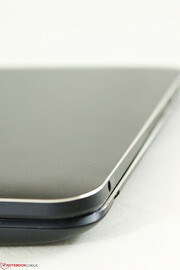 The tablet can be used upside-down or in landscape or portrait orientations without taking a hit in display quality. Scrolling through long webpages in its tall portrait mode and in such a high resolution makes browsing very easy on the eyes. Nonetheless, the default landscape orientation is preferred as viewing from extreme angles while in portrait mode will reduce relative brightness and can make it more difficult to share the display with others nearby. 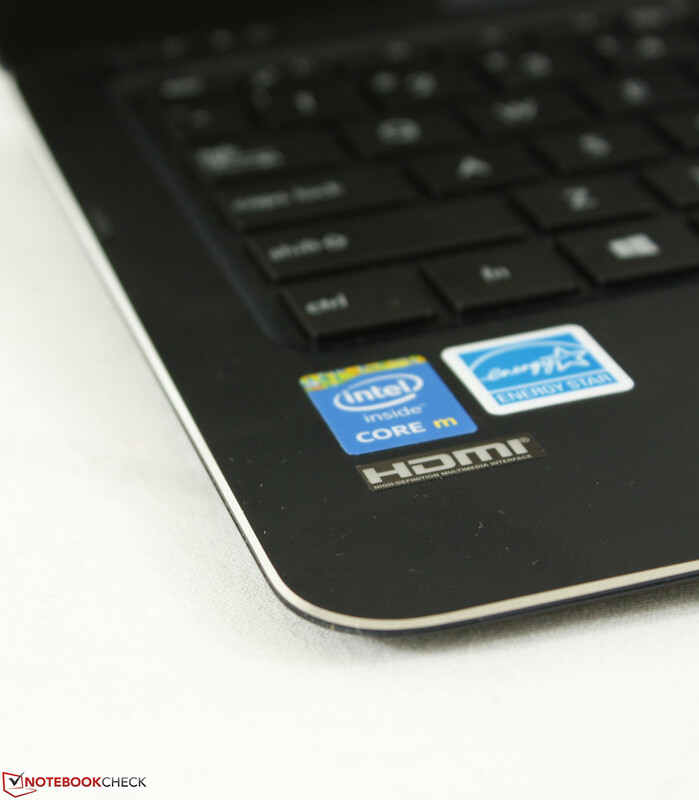 Our test model is equipped with an Intel Core M-5Y71 CPU and 8 GB of LPDDR3 RAM. When idling and in Power Saver mode, our model will run at just 800 MHz as is common for both mobile Haswell and Broadwell cores. 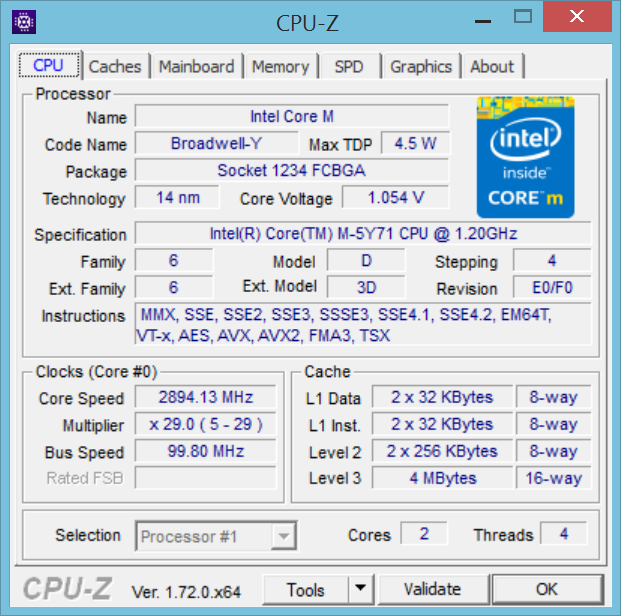 Otherwise, the dual-core Core M-5Y71 is wholly capable of running at its base 1.2 GHz clock and up to 2.9 GHz with Turbo Boost for single-threaded operations. Multi-threaded applications will run up to 2.6 GHz on the T300 Chi. 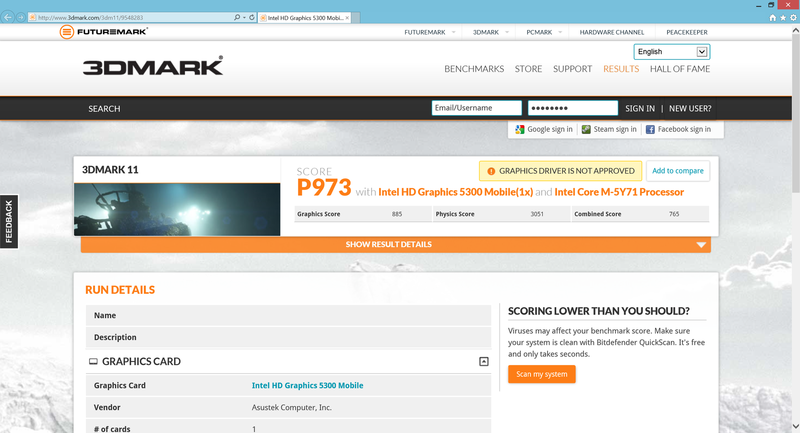 Meanwhile, graphics are powered by the integrated HD 5300 GPU. 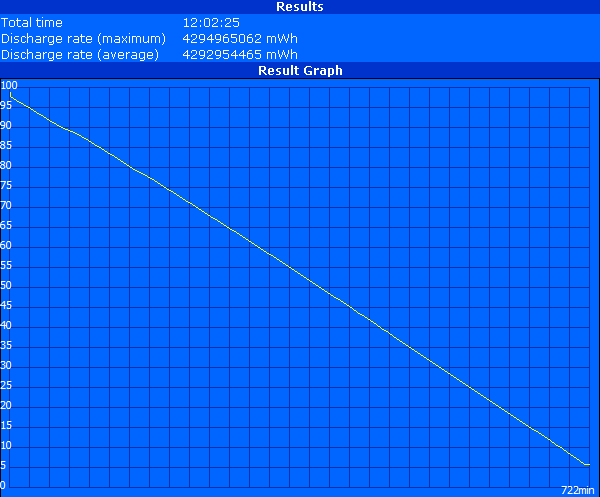 The ULV core idles at 450 MHz in Power Saver mode, but will otherwise run up to 898.2 MHz. 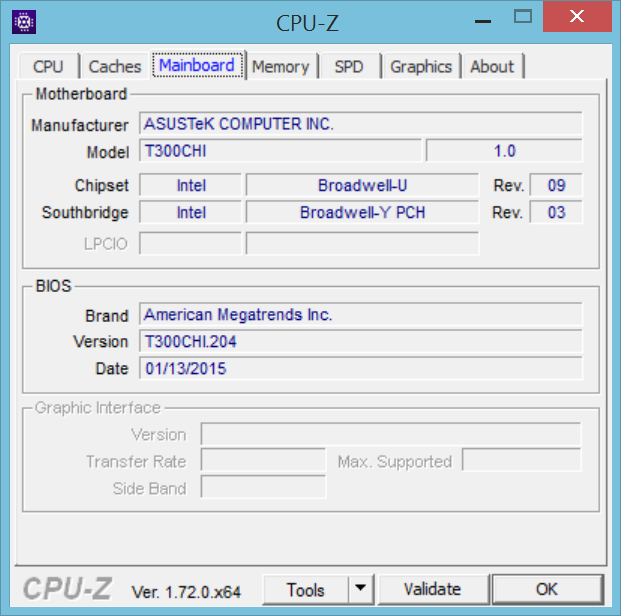 Its shared 1 GB of memory operates at a constant 800 MHz. 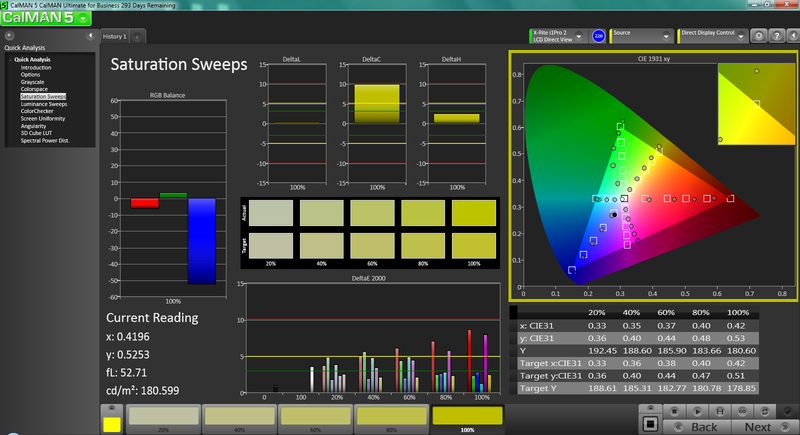 Compared to the older HD 4200, the HD 5300 is manufactured using a smaller 14 nm process with 25 percent more EUs. CPU performance is slightly and consistently faster in both single- and multi-threaded benchmarks than the ThinkPad Helix 2, which uses the same M-5Y71 CPU as does our T300 Chi. 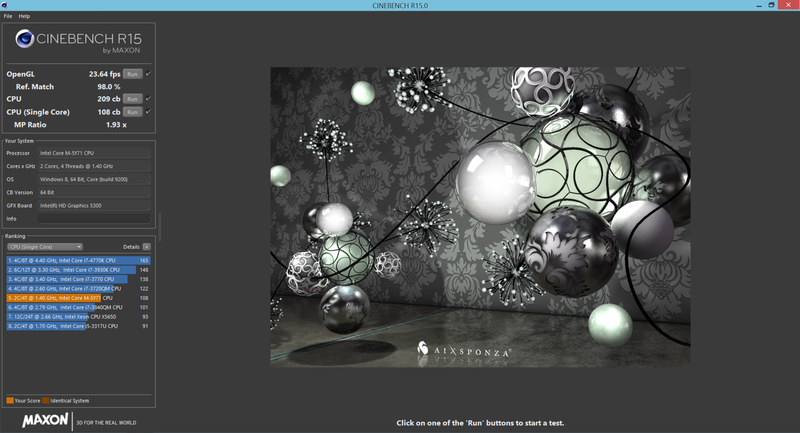 This is evident not just in the CineBench results below, but also in Super Pi as well. 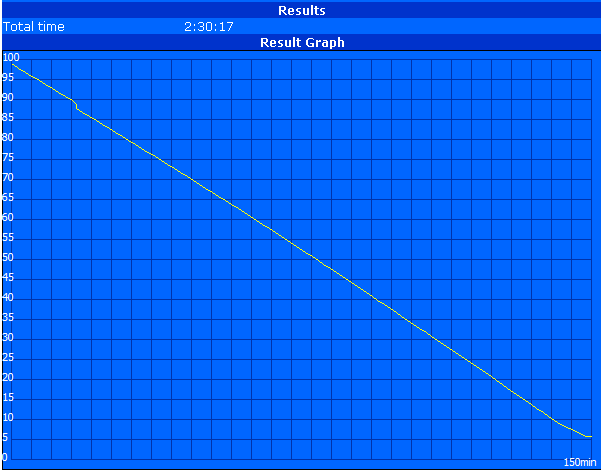 Compared to ULV i7 CPUs, however, our tablet is slower by more than just a few percentage points. 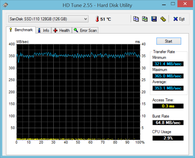 Performance-per-watt is still very good against a ULV Core i5 as it trades blows with the i5-4300U in the Surface Pro 3 while having less than a third of the TDP. PCMark scores place the T300 Chi alongside older Haswell models such as the IdeaPad Yoga 13 and Toshiba Satellite P30W. 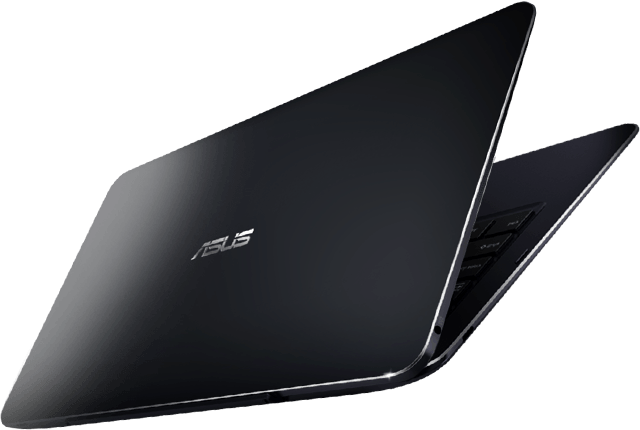 However, when compared to more recent models such as those below, our Asus falls behind by a couple of steps. 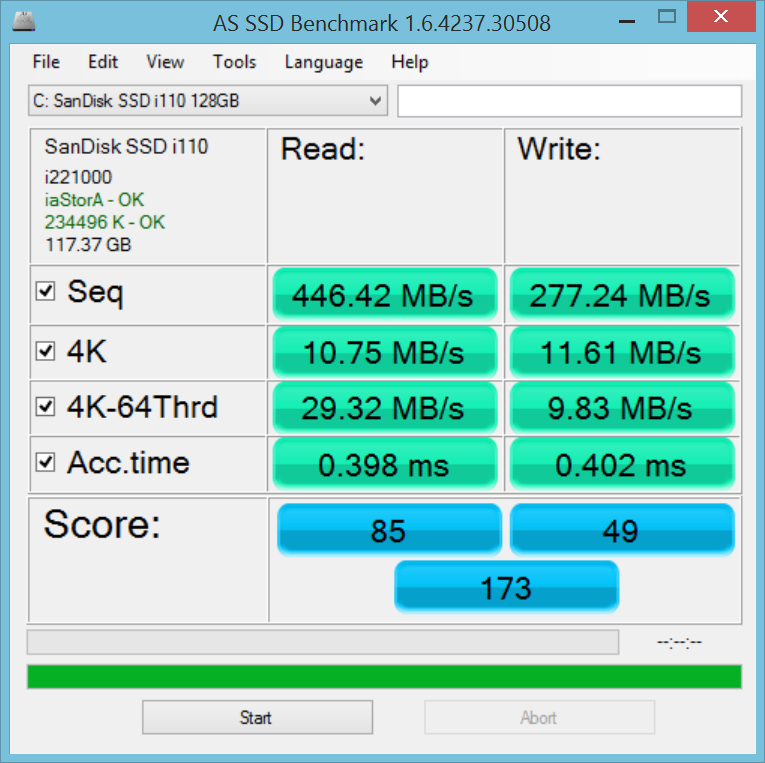 This may simply be due to any small differences in SSD performance as PCMark benchmarks tend to favor systems with faster SSDs. Subjectively, OS navigation and responsiveness are both spot-on with little delay. There is a bit of latency and skipped frames when zooming and scrolling through webpages, though certainly not serious enough to be intrusive. Scrolling through our long review pages in quick succession, for example, will definitely see some lag, as will heavy multi-tasking between applications. But for everyday applications like browsing, e-mail, or word processing, the T300 Chi performs reliably fast. Our model has a sizable integrated 128 GB SSD from SanDisk. About 15 GB is reserved for recovery, so the C drive itself is about 101 GB. 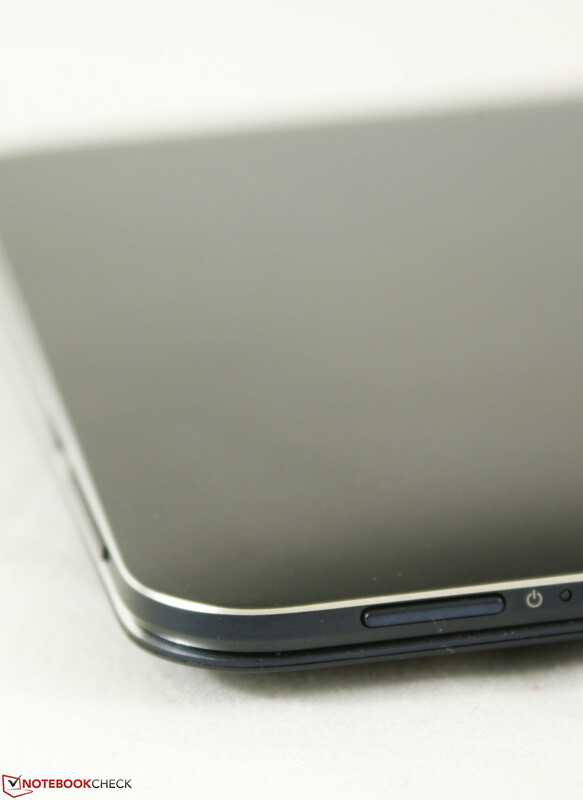 Storage space is expandable via the microSD slot on the tablet. 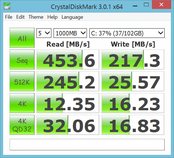 SSD performance according to CDM is below standard 2.5-inch SATA III SSDs. 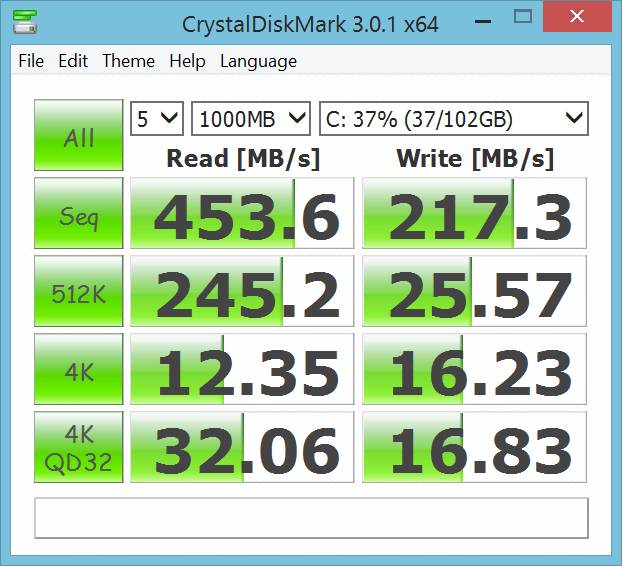 Sequential write speed in particular is just 217 MB/s compared to 300 MB/s from an Intel SSD 521 Series. 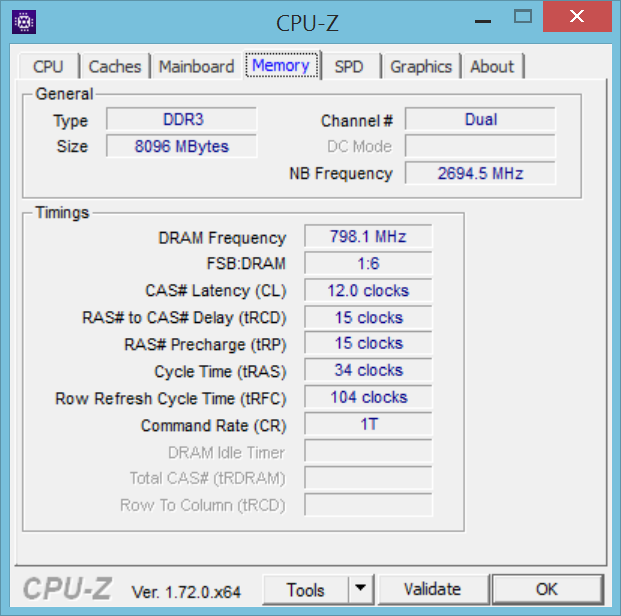 4K block read and write are also slower than expected. 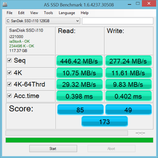 For our growing benchmarks list of SSDs and HDDs, see our table here. 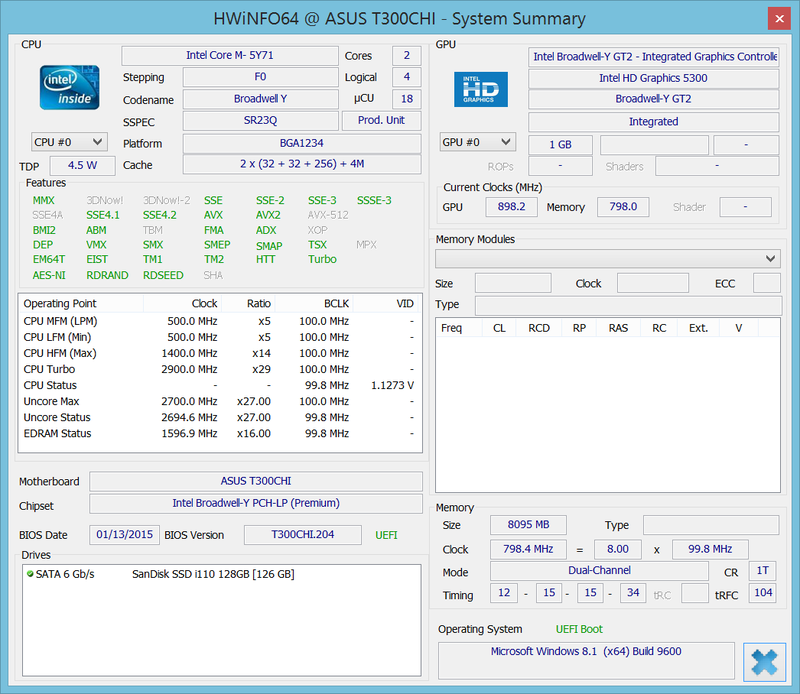 The integrated HD 5300 is an evolution from the previous HD 4xxx generation on Haswell cores. It does not focus heavily on performance gains, but instead on performance-per-watt as it performs similarly to the HD 4200 while drawing much less power. Thus, simpler 3D titles like FIFA and Sims will work best on the T300 Chi. Almost all titles will be limited to 720p or even lower, otherwise frame rates will suffer dramatically. 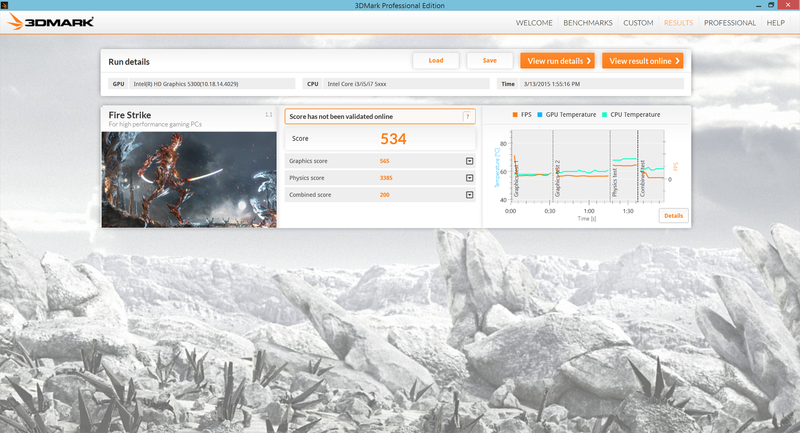 For more information and benchmarks on the HD 5300, see our dedicated page here. 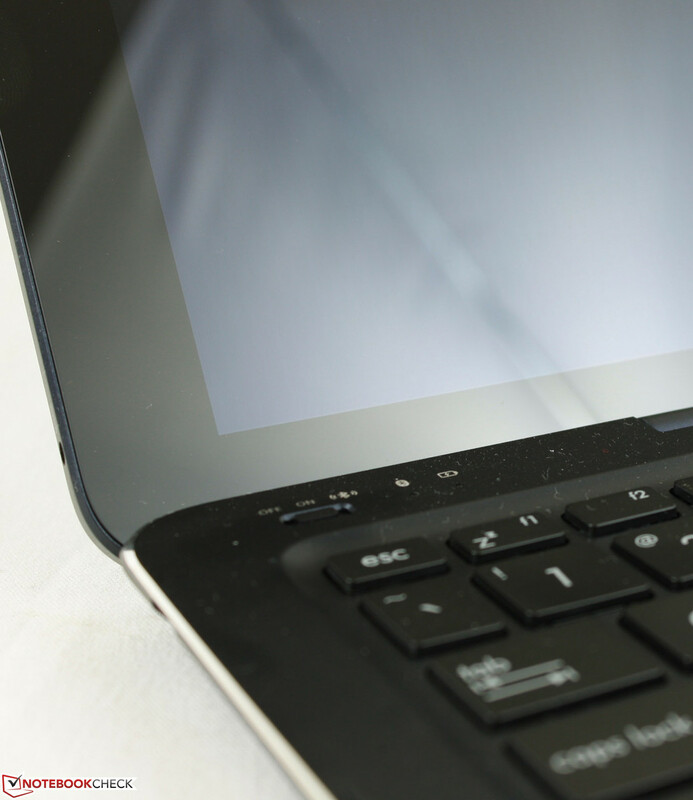 We stress the tablet to identify any throttling or stability issues. With just Prime95 active, the CPU can be observed operating at its maximum 2.6 GHz Turbo Boost for about 30 seconds before reaching 80 degrees C. Then, core clock will drop to a steady 2.2 GHz and maintain a 70 to 75 degrees C temperature. With just FurMark active, the integrated GPU can be observed operating at its base 800 MHz before dropping to the 600 to 650 MHz range. 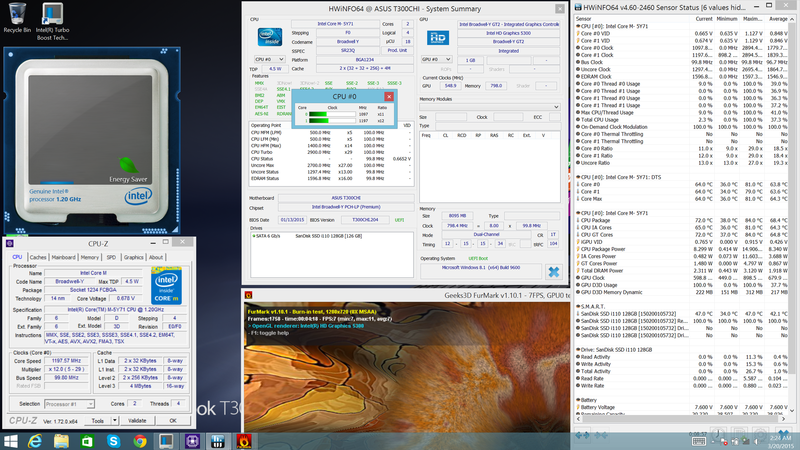 Full stress with both Prime95 and FurMark active will throttle both the CPU and GPU to just 0.8 to 1.1 GHz and 400 to 500 MHz, respectively. 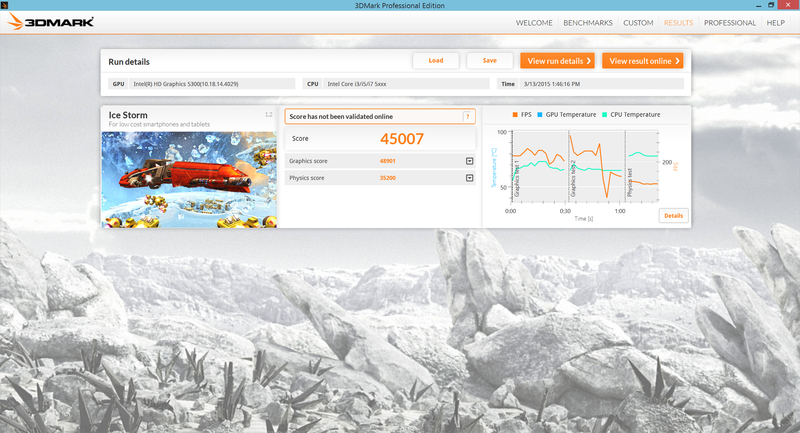 Core temperature stays constant at just below 70 degrees C, which suggests a power or TDP limitation. Next, we stress with Unigine Heaven 4.0 to better simulate typical 3D gaming. 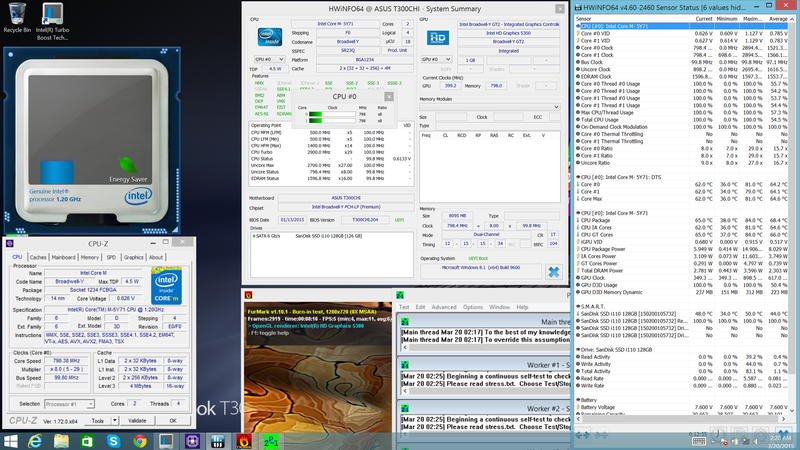 Under these conditions, the CPU experiences limited Turbo Boost benefits as it operates in the 1.2 to 1.5 GHz range. 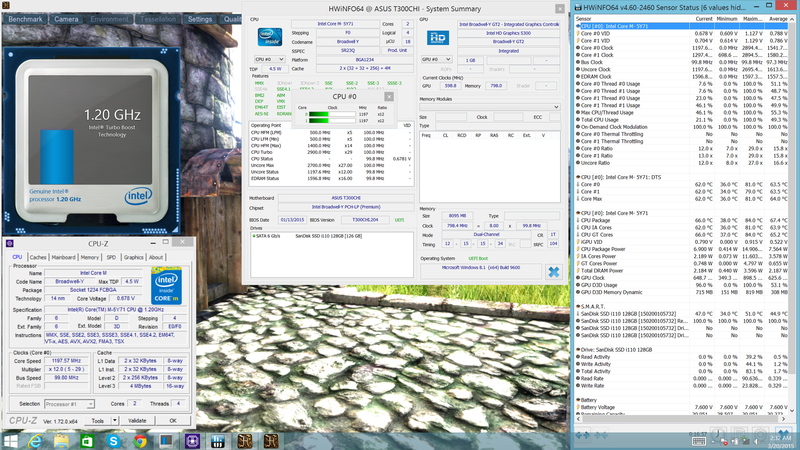 The GPU also drops to the 650 to 750 MHz range. 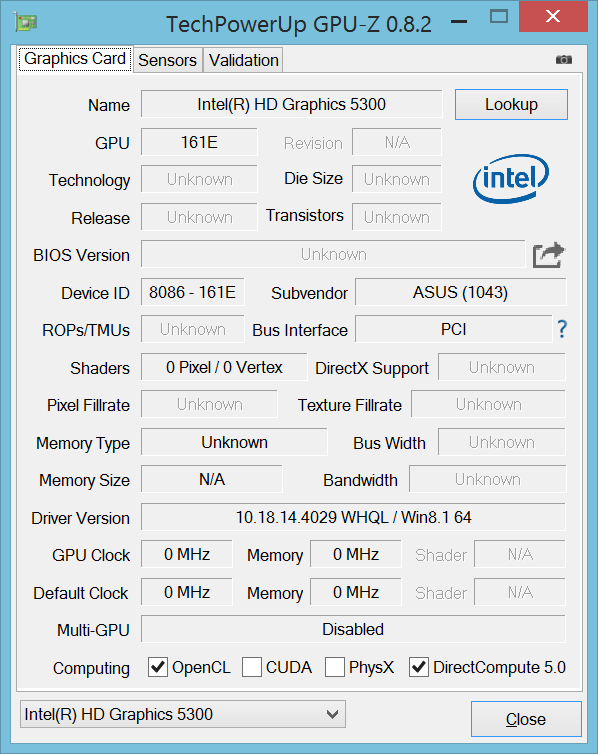 While the T300 Chi doesn't throttle, it isn't performing at its full potential either under gaming loads. Overall performance will drop if the tablet is not connected to its AC adapter. 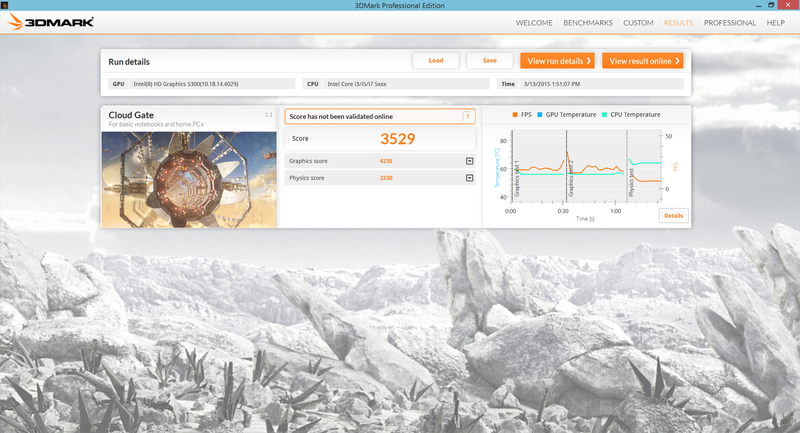 A 3DMark 11 run on battery power returns a graphics and physics score of 579 and 2251 points, respectively, versus 885 and 3051 points when connected to mains. 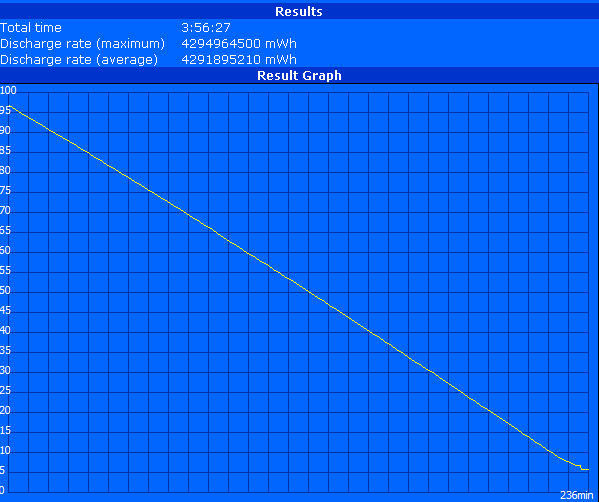 Running on batteries will limit the CPU and GPU to just 700 to 800 MHz and 400 MHz, respectively. Surface temperature when completely idle is relatively uniform on both the front and back at about 30 degrees C. Under heavy loads for an extended period of time, we were able to record surface temperatures as high as 43 degrees C on the right side of the tablet. 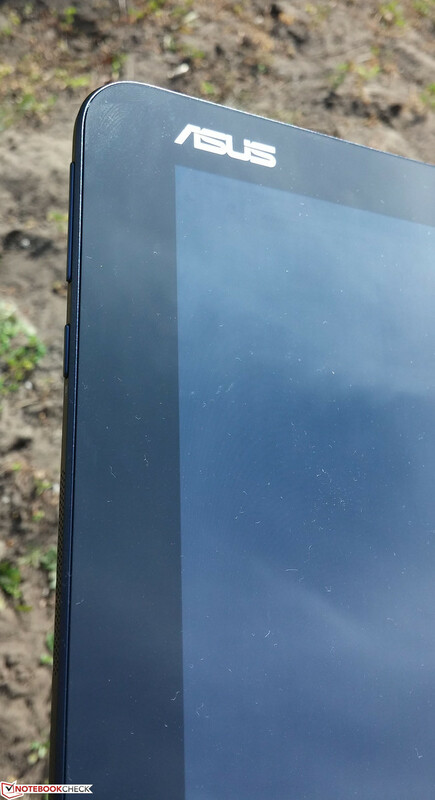 In contrast, the opposite end of the tablet experiences almost no temperature change. Thus, expect one side to feel much warmer than the other even during regular use. The similarly equipped ThinkPad Helix 2 does not experience as steep of a temperature gradient under load as the temperature rise is more evenly spread. The Core i5 Surface Pro 3 gets even warmer than our two Core M-5Y71 models despite the Microsoft tablet having an active cooling solution. 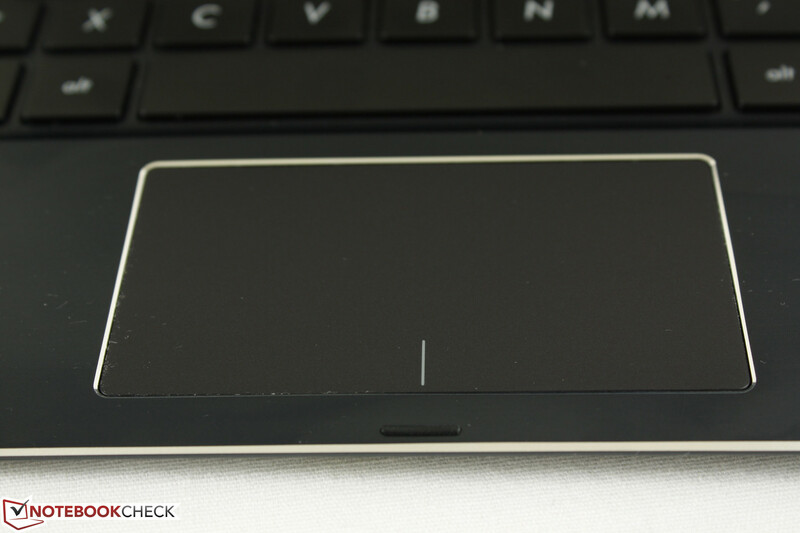 (-) The palmrests and touchpad can get very hot to the touch with a maximum of 41.6 °C / 106.9 F.
(-) The average temperature of the palmrest area of similar devices was 29 °C / 84.2 F (-12.6 °C / -22.7 F). 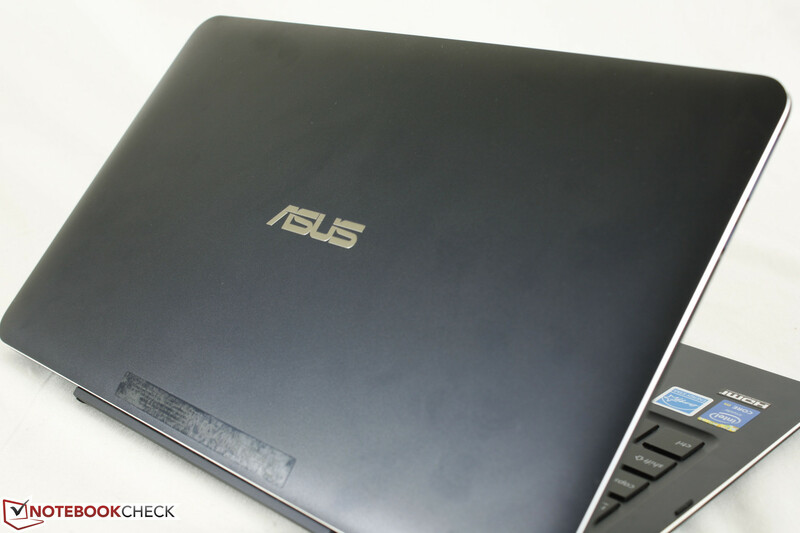 Asus boasts "powerful, crystal-clear" audio quality from the built-in stereo speakers. Sound is certainly above average for such a thin tablet, but bass is still lacking enough to recommend earphones for a better music or video playback experience. Maximum volume is reasonably loud and does not produce any noticeable static, though the tablet itself can be felt vibrating at very high volume settings. 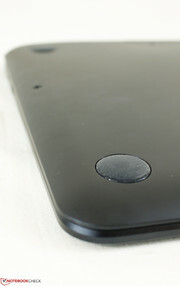 The two speakers grilles are located on the left- and right-hand edges of the tablet. It is quite easy to cover them up when holding the device in landscape mode, so it may be better for future revisions to move the grilles higher up on the edges or relocate them to be front-facing a la the Nvidia Shield. The integrated 32 Wh Li-ion polymer battery is able to provide a very long battery life of just over 12 hours - That is, if you let the tablet sit idle at the lowest backlight setting. Asus advertises an 8 hour long runtime, but our own looping WiFi test at 150 nits display brightness reveals a runtime just shy of 4 hours. The large discrepancy shows just how efficient the hardware can be when idling or at a low-power state, but runtimes are otherwise unexceptional when under consistent loads. Competing 12.5-inch notebooks like the ThinkPad X250 and Acer Aspire Switch 12 have longer runtimes under WLAN conditions by an hour at least. This can be partly explained by the higher capacity 48 and 36 Wh battery packs, respectively, in the Lenovo and Acer models. The ThinkPad Helix 2 can last for a couple of hours longer than the T300 Chi despite having the same processor, though it does have a smaller display and lower 1080p resolution. For browsing, word processing, and multimedia, the T300 Chi works wonderfully as it is responsive and more than capable for common everyday tasks. Users will be impressed by the slim design, enormous amount of RAM for a tablet, and large screen real-estate provided by the 12.5-inch WQHD screen. Its HDMI-out port and MicroSD slot further cement the tablet as a home multimedia solution for the family and its fanless design makes it great for movies. The included keyboard base doesn't feel quite as nice as the keyboards on more standard notebooks, but functions reliably nonetheless. 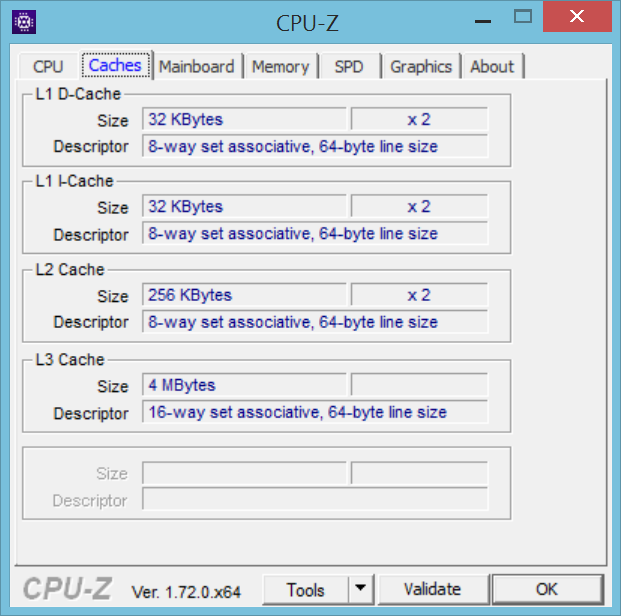 Gaming is limited to less demanding titles like DOTA 2 as Turbo Boost benefits are reduced when both the CPU and GPU are stressed. 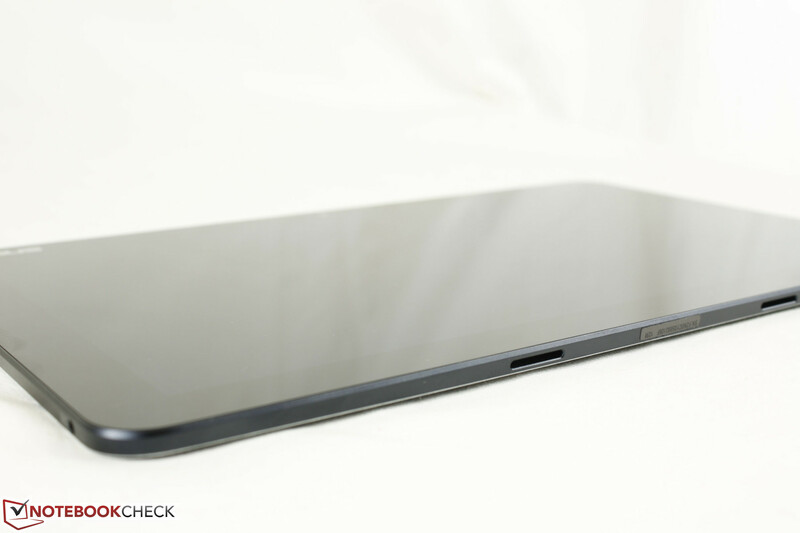 The magnetized attachment between the base and tablet is a mixed bag. While it does make it easier to snap the tablet on and off, the tablet still wobbles back-and-forth and the keyboard base itself must run on its own power source. 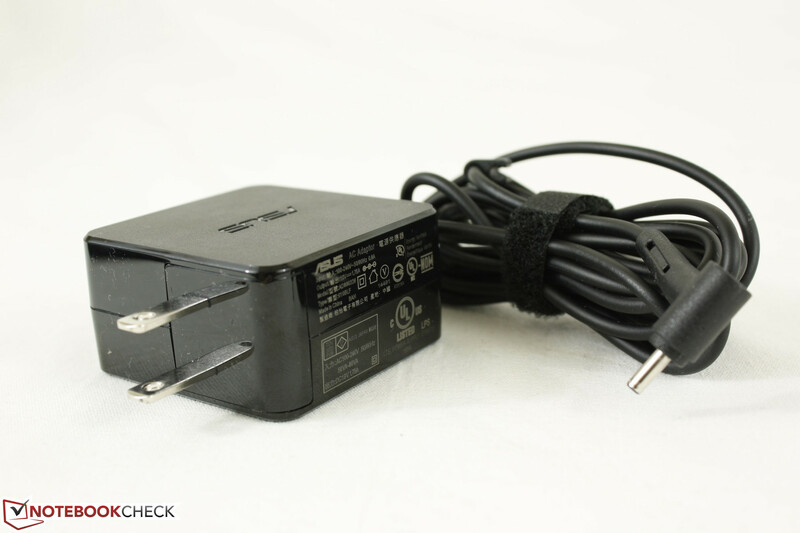 This also denies the tablet from additional ports, a secondary battery, or additional hard drives when the two are attached since there is no actual IC connection. For example, detachables from HP and Lenovo benefit from more USB ports, card readers, subwoofers, and other luxuries from their keyboard docks, such as on the Split x2 and Lenovo Miix 2 10.
Business users may prefer the Surface Pro 3 over the Asus for the simple fact that there are no WWAN or GPS options or included stylus here. The shorter runtimes may also be a concern for those who are constantly on-the-go due to the rather small battery size. 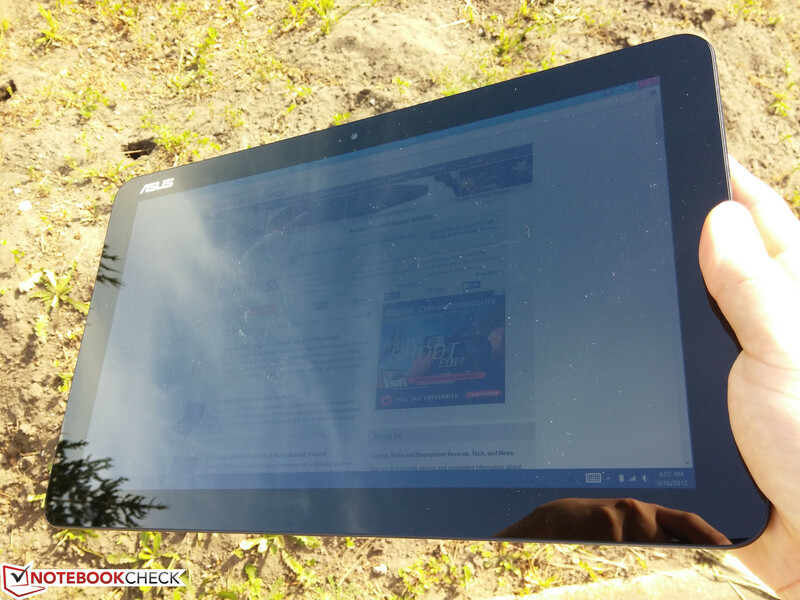 The T300 Chi isn't marketed as a business solution for these reasons, but multimedia users who want a versatile Windows tablet with the occasional use outside of home will find a lot to like. Very glossy screen, but no wipes included! Great design, very thin, and easy to use. The display is gorgeous with a healthy number of physical ports. 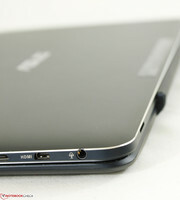 Longer battery life, backlit keys, and perhaps more connectivity options such as WWAN. The magnet hinges need improving. Where is the stylus? 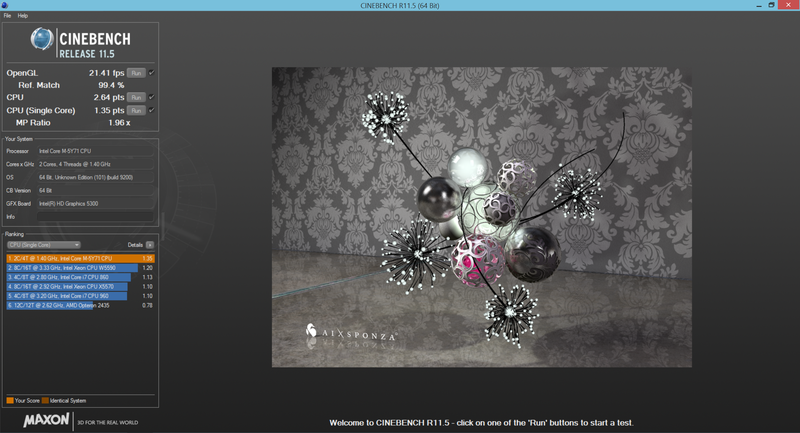 Fun to use and very responsive for a fanless Windows 8 tablet.